This is an example of how it's important today to have your own design everywhere. It doesnt matter how much do you paid for your computer, which brand, how powerful it is or whatever, it should look like yours, instead of "the brand that everyone have". All graphic designers have a mac, unfortunately we have no choice, even if everyone will find this great, we prefer trying to be original. 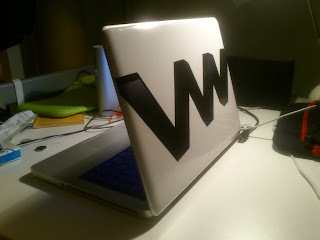 This one visualworker's logo designed was simply printed on a sticker paper specially made for laptops and quite shiny, so you can personalize any computer with. And this will make ALL the difference.